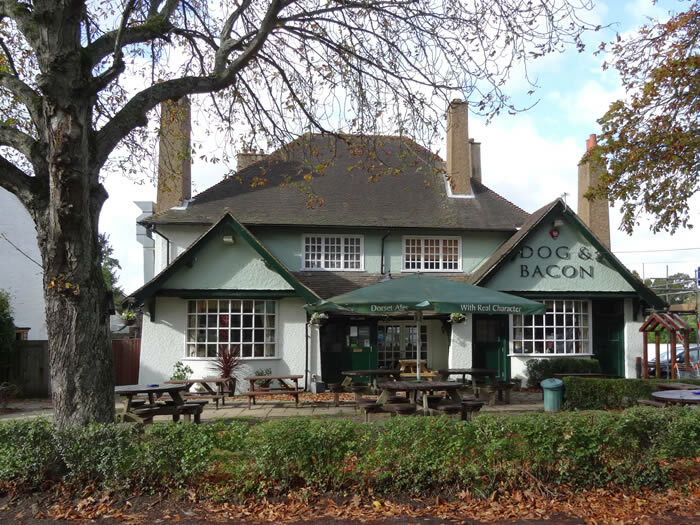 The Dog and Bacon is a Hall and Woodhouse pub close to the centre of Horsham. It has two bar areas and garden with tables at the front, although the road can be busy. I've stopped here a few times at the end of long cycle rides because it's only a short trip home from here! The old cottage next door was the original pub and the pub name comes from the "Dorking Beacon" which, apparently, was a bonfire on the site of Horsham common - the last remains of the common is a triangular green area just next to the pub. At least, that is what I have been told. If you know something different about the pub name, let me know. Why not cycle to the Greets Inn in Warnham? Turn left [slightly downhill] out of the pub and take the first left into Redford Avenue. After approx 0.5 miles [0.8 km], turn right on the cycle path across Rookwood golf course [beware.. low-flying golf balls!]. After crossing the golf course, follow the cycle path round to the right. After the tunnel under the A24 dual carriageway, continue left past the deer park on your right. At the T-junction, turn right to Warnham. Up and over the hill and then left into Friday St which is half way down the hill [0.75 miles / 1.2 km] - the Greets Inn is on the left.